Trinity Mirror's new national daily will publish its final edition on Friday 6 May. 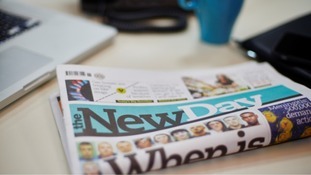 The New Day will be the UK's first new standalone national newspaper in 30 years. A spokesperson for Trinity Mirror said that the group believed that "the basis used for calculating the damages is incorrect" and that it would be considering asking leave for an appeal. Trinity Mirror notes the judgment released today by Justice Mann. We have said all along that we would pay full, fair and proper compensation to the claimants and that is not in dispute. However, damages need to be proportionate to compensation awarded in previous cases of physical and mental suffering. We are currently reviewing the judgment, which is of some length, however our current view is that the basis used for calculating the damages is incorrect, and as such we are considering whether to seek permission to appeal. Trinity Mirror has admitted for the first time that some of its journalists were involved in phone hacking. The publishing group which publishes the Daily Mirror, Sunday Mirror and Sunday People has agreed to pay compensation to four celebrities who had sued over hacking of their voicemails. Actor Shane Richie and former England manager Sven Goran Eriksson are among ten people Trinity Mirror group has agreed to compensate for phone hacking claims, the newspaper publisher has said. Richie himself was among four people the Daily Mirror owner promised to compensate after admitting intercepting voicemails "many years" ago, while his wife and agent have also settlements over hacking claims. Also on the list were fellow soap actors Lucy Benjamin and Shobna Gulati and TV presenter Alan Yentob. The group also said it had already agreed settlements with six other people named in full below, including former England manager Sven Goran Eriksson, Doctor Who actor Christopher Eccleston and Abbie Gibson, the former nanny of David and Victoria Beckham. Newspaper publisher Trinity Mirror has admitted for the first time that its journalists hacked phones after agreeing to compensate four people. In a statement, the publisher of the Daily Mirror and other titles said it admitted liability for allegations that it intercepted the voicemails of four unnamed individuals "many years" ago, adding that it had apologised and had agreed to pay compensation. The group also confirmed six other claims had already been settled for agreed sums. Trinity Mirror has very nearly lost its shareholder vote on executive pay, even though the boss, Sly Bailey, has already quit. Nearly 46% voted against the pay deals, which is still a very significant revolt. Full detail of the shareholder vote are available here. The sheer number of big firms having to confront shareholders' wrath makes a trend and there are likely to be more in the next few weeks. Trinity Mirror chief executive Sly Bailey has announced that she will step down from her role by the end of the year. Trinity Mirror publishes the Daily Mirror, the Sunday Mirror, The People, the Daily Record and over 260 other titles. For the past ten years I have had the privilege of being CEO of Trinity Mirror Plc, a fascinating and all consuming role. Newspapers are a business like no other. Now I feel the time has come to hand over to someone else to take up the challenge and for me to seek new challenges and opportunities elsewhere. My immediate priority is to continue to run the business, to deliver the best possible performance for 2012.